Announcements for upcoming events/activities and more than you ever know about Bats - Be Afraid! 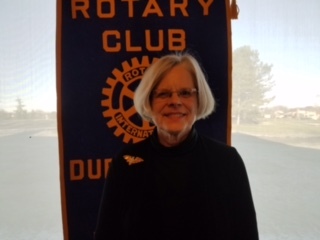 Cindy Groeniger reminded us that the Friday, March 17 meeting will be held at the Blarney Bash tent. Volunteers are needed post-meeting for set up. Dave Williamson is looking for a few volunteers today between 4-4:30 (March 10) to help with the delivery of Blarney Bash fencing and placement; it is anticipated that this will only take about 15 minutes of actual work. Alan Abouhassan sent an e-mail invitation for a Rotary NCAA tournament bracket at a cost of $20. The easiest way to pay is to be billed by the club, but if you prefer another payment option, please contact Alan.